Disappointed. F105 Looks great, flies anemic! Terribly under-powered. Easy to assemble. Very easy to bind and get all surfaces working correctly. Haven't flown it yet. Overall great plane. I finally got around to flying the 105 this morning and it was delightfully uneventful. I had done a little research online and other than setting it up per the manual, I put 60% expo on the aileron channel and I'm glad I did. I think this girl would get a bit squirrelly without quite a bit of expo because with the elevons she really wants to roll axially with minimal input. I also programmed in some dual rates, I think as described by the manual, but I found that I needed to immediately put it into high rates to get enough elevator throw to stay aloft immediately after throwing it in the air. It picked up speed pretty quickly and maybe I could have kept it in the air on low rates but I switched it straight away and kept it there for the remainder of the flight. A couple other things to keep in mind are that this plane goes fairly fast for its small size and the excellent paint job really blends in with even a blue sky. I don't think I'll fly it on a cloudy day until I'm totally comfortable with it, maybe not at all. Another thing to add is that I would recommend setting it up mechanically with some up elevator at the neutral position. My buddy threw it for me at about a 25 degree incline and after about 40' I switched the dual rates to high in order to ensure she stayed aloft. I stayed at high rates the rest of the flight without issue. Finally I'd add that she likes speed. If you slow down too much you'll find her fairly unresponsive and losing altitude. You'll need to stay on the throttle the whole time, this is not a glider, and as such you'll blow through the battery pretty quickly. I didn't time my flight and my battery wasn't 100 charged but it felt like a short flight and the battery was down to 3.7 vpc when I checked after the flight. Don't push it the first few flights and be sure to use a battery with a high C value. All in all, I'd recommend as an affordable and really cool-looking EDF. Like stated by others. A very good looking plane and took very little time to set up to fly with my radio. My second EDF. I did not read any reviews before flying and I set my plane's throws as the instructions said. I flew flight one on low rates. I used an older 2200 mAH battery positioned so that the CG was about 1/2"' forward of instructions call-out. I had a friend give it a strong toss slightly upward with full throttle. I struggled to keep it flat and it skipped off the ground twice gaining a max altitude of about 3' before I killed the throttle for fear of running out of runway space; it stopped about 150' from the toss point. Attempt #2 was about the same but the blade on the bottom hit some mud and the plane slowed quickly, so again I killed the power. Toss number three I held the wings level and about 3' of altitude for a long time before gaining momentum and starting a slow gradual climb out. Once up, I backed off the throttle to trim it. Once flying it was very fast and exciting. It lost a bit of speed in sharper turns, so i adjusted my flying for that. When it came around the far turn it would disappear for an uncomfortably long time against a very grey sky, I did not like this at all. Note to self, only fly this one on perfect blue sky days. It landed nicely without event. Once in the air it flew as I expected for an EDF shaped like a dart. I would say this requires a high intermediate to advanced pilot (I believe that's about where I am and this took my complete focus). I will not try to hand toss this one myself and I might try a smaller fresher battery next time. Saw these bought both, thunderchief and crusader. Freewing quality for 100 quid. Yes they are small but that makes them very portable! Quite a bit of expo, not inheritably stable around the longitudinal axis, only 3 channel but requires skill. Goes out of sight quickly, with those big sweeping turns, which can be uncomfortable. They considered the ease of adding a rudder, which I think will, actually making it easier to fly and enjoy so I think, if successful I'll do to both. I found I found lowering pwr in the turn to allow the nose to drop in otherwise fights against itself with pushing force at the back with the "pulling it around" with the evelons. Unless you bank it 90 degrees and pull it around with the elevator but as mentioned above about the stability around longitudinal axis.....eek.. Battery.. (1300, turnigy graph 75c) 2+1/2 mins! Not a long flt! Watch that. Great model, great love it. Keep em coming guys! Great job PS rc motion service is excellent! And packed perfectly. Bought this plane back in Sep of 2018 and have logged more than 30 flights on it thus far. This was my first 64 mm EDF, I eventually have purchased the F8 Mig 15 and F9F for the 64 mm. 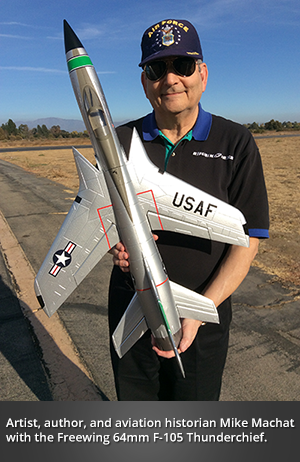 The Thunderchief performs very similar to the F8, and both when hand launched, will sink upon being released. Once up and cruising the Thunderchief flies real nice and you can back the throttle off to half and enjoy the flight. The silver will blend in to white or grey skies, but the black nose cone can help you track it under those circumstances. Keep the speed up in turns, and she will zip around the sky like an EDF powered lawn dart.